Engine cranes, or engine hoist cherry pickers, are used for engine removal applications. Frequently employed by automotive mechanics and DIY vehicle hobbyists, they enable you to lift engines out of their compartments and lower them into work areas to perform restoration or total engine rebuilds. 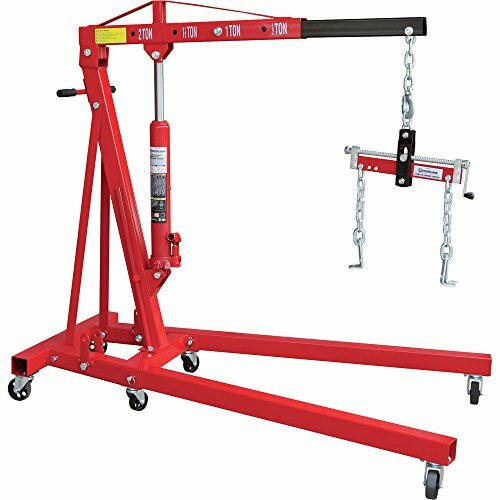 These shop cranes generally provide solid power combined with collapsing frames for easy storage. Many users who have typically rented hoists endorse purchasing them, saying that after two applications they've paid for themselves- and since they fold up they're not too much of a nuisance to keep in your garage. Users say that it assembles in about 30 minutes and folds up easily to be rolled into the corner of your workspace when not in use. Buyers also comment that it is a sturdy and powerful unit- ideal for swapping out engines at a reasonable price. One buyer writes that he was able to easily lift out a 500 pound vertical compressor, moving it around on the engine hoist's casters right out of the box. During shipping some users say that the nuts and bolts can get loose- but generally buyers have said that all the components were accounted for. The instructions are not the best either, but most users are pretty savvy working with their hands and generally figured out how to assemble the engine hoist without too much trouble. Torin support is also pretty acclaimed- so if you experience any issues you can always contact them for help. Let's take a look and find the best-selling shop cranes on the market today see how they compare. This foldable engine hoist is a handy, well-thought device made from premium steel that would help you lift heavy loads. Users love that the steel wheels allow them to move the engine hoist in any direction and that the crane is sturdy, stable and can be folded when there is no need for it. But some note that it was not very easy for them to assemble it. With a folded size of 58” x 37” x 22” and a working size of 65” x 41” x 37” the engine winch has a boom range of 102 inches, square tube legs made from thick steel, a vertical thick mast made from premium steel, a 12” steel chain, and a 5/16” hook, an 8-ton hydraulic ram and a boom capacity up to 1000 lbs. It seems like a very efficient tool if you are looking for good quality and a price. The general consensus is that people love this high-grade motor crane. They comment that the cherry picker lift is well-thought, solidly build and the hardware is of high quality. One user shared that the motor winch was easy to operate, worked great and the delivery was fast, while another mentioned that he managed to pull 2002 jaguar engine up with the help of the foldable winch and he was very pleased with the value and quality of the product. One other purchaser shared that the ability to fold it into a more compact form was a great advantage for him. However, most customers complain that the instructions were very unclear or written in a tiny print. This 2-ton Torin engine hoist is well-designed, sturdy and a foldable tool made from steel that would help you do your heaving lifting. Users love that this vehicle winch is exceptionally strong, stable, very easy to operate, maneuver and store when the heavy work is done. But some customers note that some parts of the lifting crane don’t fit well. With a working size of 59.8 x 21.3 x 6.3 inches and a lifting range from 1 inch to 78.75 inches, this engine winch has 6 wheels for additional mobility, four possible boom positions, a boom capacity up to 1000 lbs. and an 8-ton heavy-duty long ram. It’s worth considering if you are ever in need of a helping mechanical hand. Generally, users are very pleased with the Torin engine crane – they praise its mobility and how easy it is to assemble and control it. One buyer shares that he managed to lift his 66 LeMans engine without problems and that it worked very well with all adjustments. A pleased customer expresses his satisfaction with the design, manufacture and customer service, while another comments how easy it to fold the winch by just pulling a pin, folding the legs and putting the pin back. However, some customers have complained that the motor engine hoist came with missing hardware parts and recommend checking the package on arrival. 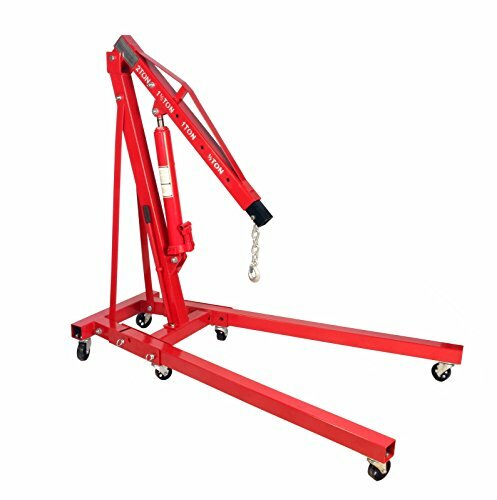 This 2-ton cherry picker crane is a durable and well-made product from high- quality steel that would lift your car’s engine without any problems. Users love that the motor hoist is easy to operate, control and transport. However, some customers note that for them it was difficult to assemble the 2- ton motor hoist due to poor instructions. This engine winch has a closed boom height of 4 inches and a max opened boom height of about 8 inches and a boom capacity up to 1000 lbs. combined with an 8-ton ram hydraulic cylinder. 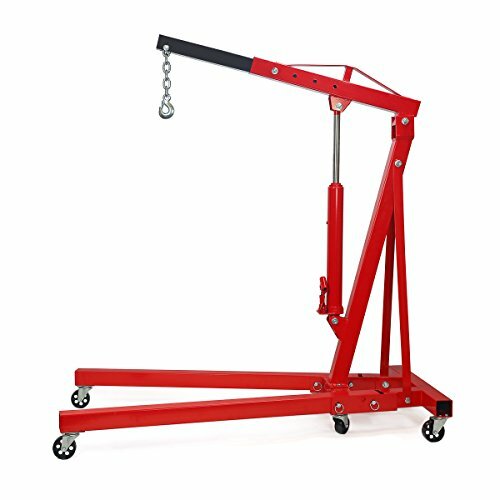 Folded this vehicle crane has a size of 31″ x 29″ x 50″ and could be kept easily in your garage, so it seems like a good choice if you are looking for a high-quality hoist. Generally, people are happy with the performance and quality of the 2-ton cherry picker motor hoist – they are pleased that it’s stable enough, very heavy-duty, well-built and that the customer service is very responsive. One user shares that he managed to hoist both the engine and transmission of his car with this motor crane without any problems. He even left them hanging for a few days and the crane didn’t move an inch. Another one comments that the lift arm is nice and long and he has no problems reaching an engine properly and safely. The biggest complaint most of the customers have is that the lifting crane arrived with some missing hardware parts and packages were delivered in very poor condition. The 2-ton cherry picker folding engine crane is well-built, sturdy and an easy to use product made from premium steel. Users love that this cherry picker lift performs well and that it could be folded and stored away. However, some customers note that the foldable engine crane arrived with missing parts. The folding motor winch has a folded size of 58″ x 37″ x 22″ and a working size of 58″ x 37″ x 22″, plus 3″ x 3″ square tube legs, a thick steel vertical mast, a forged steel chain, and a hook. So, if you are looking for a good quality, this folding engine crane is a solid choice. Generally, buyers are pleased with the quality and price of the 2-ton cherry picker lift. One reviewer says that the crane worked perfectly right after he put it together, while another one shares that he is very pleased with the quality and functionality of the engine hoist, but mentions that it arrived missing a wheel. Another purchaser described how the engine crane arrived in two separate cheap cardboard boxed and that the first box was in very poor condition. He is happy with the engine itself, noting that it’s stable and works well, but for him the legs are not as wide apart as he would have preferred. 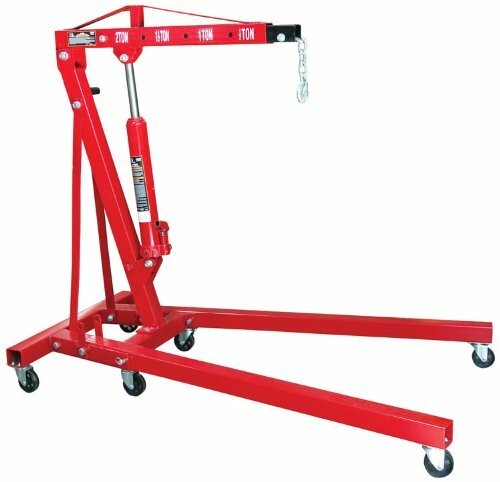 The 2-ton Strongway Hydraulic motor hoist is well-designed, well-built and a durable tool made from high-grade steel which will raise, lower or move engines and other heavy loads without any significant effort. Users love that the motor winch is sturdy, easy to maneuver and that it comes with a load lever. With a folded size of 28 x 29 x 60 inches, and a working size of 64 x 39 x 51 inches, this 2-ton motor hoist has a lifting range from 1 inch to 82 inches, six wheels, a boom capacity of 4000 lbs, a 6-ton long ram jack capacity and four boom positions. The load lever has a capacity of 1,500-lbs., so it’s easier and safer to handle and position engine, differential, and transmissions. Overall, this looks like a solid option if you are looking for an engine hoist. Generally, users were very pleased with the performance of the lifting engine crane – they find it very sturdy and heavy-duty, but easy to control and move around. One customer shares his advice that this 2-ton motor hoist is a necessity for every garage. He finds the process of assembling the hoist to be difficult and nerve-wracking, but for him, the end result is worth the trouble. One reviewer who purchased the Best Choice products 2 ton engine hoist was pleasantly surprised- saying that it was an inexpensive, but quality option, for the home garage hobbyist work he does on his own. Specifically, he does a variety of automotive repairs on different styles of vehicles and says that he decided to purchase one of these engine hoists because he was sick of renting them. After having done a couple of major hoists, he says that the cherry picker has paid for itself. While it was pretty difficult to actually assemble this engine hoist because the instructions were pretty poor and didn't effectively identify all of the different parts, his automotive and engineering skills kicked in and he was able to figure it out. Once assembled, he commented that it has a pretty small footprint, especially when it is folded, and can be tucked out of the way in his two-car garage, but it is still a strong enough engine hoist that you can perform drive train assemblies without any problem whatsoever. Another user was not as impressed with the quality of the build- they said that the price was really cheap and it will work for a moderately long time, but it's not an ideal long-term solution because the jack slowly skips over time. The Torin engine hoist comes from a reputable brand with quality customer support- one user who experienced cylinder leaks from the ram cylinder contacted Torin and was happy with their no-hassle support, which promptly provided him a replacement ram. Other users have said that it is an exceptionally strong hoist that is highly controllable- saying also that the design and build of the engine hoist is particularly good. One automotive technician said that it took him about 30 minutes to assemble this particular hoist- and he particularly commends its collapsibility, which enables him to fold it up and store it in his garage when not in use. As you can imagine, it can be a little bit challenging to ship one of these engine hoists. Users say that these are truck-ship items and the cardboard boxes that they arrived and are pretty much decimated when they appear. Some users, especially one that purchased his engine hoist at a warehouse discount, did comment that some pieces were missing- while annoying, they were easily sourced a local hardware store. 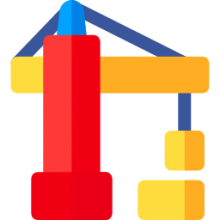 What we have generally seen, is that it's worth spending the extra money to purchase a shop crane that isn't poorly constructed- for a couple hundred dollars more and you'll be able to purchase a sturdier and longer-lasting engine crane without shoddy manufacturing. Shipping is a bit hit or miss- with such a heavy product with so many loose parts there can sometimes be issues with missing components or disintegrated packaging but in general they arrive fully functional. 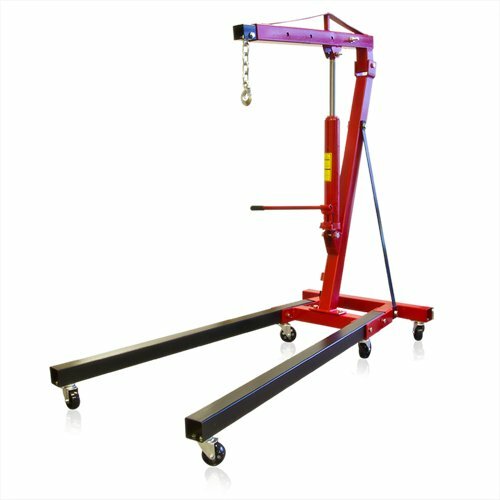 All that said, if you are an automotive technician or home hobbyist that has typically rented one of these units when needing to perform an engine swap, you might be interested in purchasing a shop crane if you find yourself frequently performing tasks that require it because renting it is more expensive than owning it.